Pentax's upcoming entry-level DSLR, that we brought you news of on the weekend, is now official. It's actually named the K2000 inside the US and K-m outside. The sensor is indeed 10.2-megapixels and it does have a 2.7-inch LCD and lacks live-view, just as we'd heard. With an auto scene-detection mode, it's also aimed squarely at amateur DSLR users, though it has the "Shake Reduction" tech found on higher-end K-series. Press release below.Pentax is also releasing new lenses for the K system: the DA L 18-55mm lens and DA L 50-200mm ED zoom (both designed to be affordable versions of existing lenses), and the high-end DA Star 60-250mm zoom and DA Star 55mm—this last with a f1.4 aperture. With a bundled DA L 18-55mm lens and AF200FG add-on flash the K2000 will cost $700 in the US in November. GOLDEN, Colo. —(Business Wire)— Sep 22, 2008 PENTAX Imaging Company has announced the PENTAX K2000 DSLR system designed specifically for consumers who are ready to make the transition from a point-and-shoot digital camera to digital SLR photography. The PENTAX K2000 is an entry-level system consisting of the new PENTAX K2000 body, the smc PENTAX DA L 18-55mm f/3.5-5.6 AL lens,(a) and the PENTAX AF200FG Auto Flash. Bundled as a complete kit for the convenience of the customer, the PENTAX K2000 system offers uncomplicated operation for new digital SLR users and family photographers seeking high-quality digital SLR photography for the first time. Combining PENTAX developed, easy-to-use Auto Picture modes as well as powerful learning functions all housed in one of the smallest, lightest camera bodies in its class, the PENTAX K2000 system is ideal for digital SLR beginners. Additional features on the newest digital K2000 SLR body include a 10.2 megapixel CCD, a 2.7 inch, 230,000 dot high resolution, wide-view LCD panel, and an ultra compact design that facilitates one handed operation. The body also features the same PENTAX developed Shake Reduction technology found on more advanced K series digital SLRs. PENTAX Shake Reduction is compatible with more than 25 million PENTAX lenses to deliver sharp images even when handheld at slower shutter speeds. The K2000 also features the powerful PENTAX developed Auto Picture Mode, which selects from Portrait, Landscape, Macro, Action, and Night Portrait modes to tailor the camera settings for any photographic situation. The camera also has a comprehensive Dust Removal system to help keep images spotless. A dedicated programmable help button clearly explains current camera settings to guide and teach the user about digital SLR photography. (a) Note: The smc PENTAX DA L 18-55mm f/3.5-5.6 AL and smc PENTAX DA L 50-200mm f/4-5.6 ED lenses will only be available in the US as part of the PENTAX K2000 Lens Kit or PENTAX K2000 Double Zoom Kit. This new PENTAX digital SLR body will only be available under the PENTAX K2000 product name in the US. 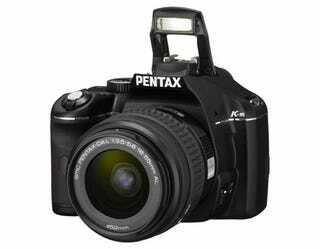 The same body will be available under the PENTAX K-m product name outside of the US. The lens included with the PENTAX K2000 system is the first of a new series introduced with the DA L designation. Along with the smc PENTAX DA L 18-55mm f/3.5-5.6 AL lens, PENTAX is announcing the smc PENTAX DA L 50-200mm f/4-5.6 ED zoom lens. The affordable DA L series offers the same optical design, construction and compatibility as the current smc PENTAX DA 18-55mm II and smc PENTAX DA 50-200mm lenses. Also included with the system is the easy-to-use PENTAX AF200FG Auto Flash. This hot-shoe flash features a compact, lightweight body, wide angle diffuser, a guide number of 20 (at ISO 100/m) and simple dial operation to assure effortless flash photography for everyone. PENTAX has also announced two high performance interchangeable lenses for use with PENTAX digital SLR cameras to deliver top-quality digital images. The smc PENTAX DA Star 60-250mm f/4 ED[IF] SDM is a versatile telephoto zoom lens offering a high zoom ratio, while the smc PENTAX DA Star 55mm f/1.4 SDM is a compact medium-telephoto lens offering a large maximum aperture. The two lenses are the newest members of the exclusive DA Star series, and each is designed to deliver top optical performance. Combining a host of advanced technologies including extra-low dispersion (ED) optical elements and PENTAX original lens coatings, these new lenses assure outstanding image quality with clear, high-contrast images, even at edges of the image field. These Star lenses also feature water and dust resistant sealing for reliable operation in inclement weather conditions, as well as the PENTAX Quick-Shift Focus system to allow instant auto-to-manual focus switching. The objective lens surfaces are treated with the PENTAX original Super Protect (SP) coating. This special fluorine compound is applied to the lens surface through a vapor deposition process to create a surface that effectively repels dust, water and grease, making it easy to wipe off fingerprints and cosmetic marks. The combination of special lens coatings, ideal curvature and best positioning of optical elements assures these lenses are designed to optimize digital imaging characteristics, while effectively minimizing flare and ghosting. Additionally, the DA Star 55mm f/1.4 lens also features a new Aero Bright coating for maximum light transmission, as well as rounded diaphragm blades to create a more circular aperture for smooth, beautiful bokeh at large apertures. The image circle of the lenses is perfectly proportioned to the image-sensor size of PENTAX digital SLR cameras, and despite the large maximum aperture, the lenses are designed to be compact and lightweight to enhance maneuverability and operability. PENTAX also announced the PENTAX AF160FC Auto Macro Ring Flash. This accessory flash unit is uniquely suited for advanced close-up applications using the automatic exposure-control system of PENTAX digital SLR cameras. Designed to offer uniform lighting on a subject to minimize shadows, the flash is ideal for close-up, portrait, product, dental and medical applications. All of these products will be exhibited at the PENTAX Booth during the Photokina 2008 Trade Show from September 23 – 28 in Cologne, Germany. Two additional products will be previewed under glass during the show including a fifth model in the acclaimed PENTAX DA Limited series. The smc PENTAX DA15mm f/4 ED AL Limited lens offers ultra-wide-angle image capture and is designed for exclusive use with PENTAX digital SLR cameras. PENTAX will also preview the smc PENTAX DA 1.4X SDM Rear Converter. This is the first PENTAX rear converter equipped for autofocus operation on PENTAX digital SLR cameras, and the product will feature the SDM autofocus drive for accurate, extra-smooth, and super-quiet autofocus operation. Pricing and availability(b) in the United States are as follows: * The PENTAX K2000 digital SLR system with smc PENTAX DA L 18-55mm f/3.5-5.6 AL lens and PENTAX AF200FG flash will ship in November 2008 at US $699.95. * The PENTAX K2000 digital SLR system with smc PENTAX DA L 18-55mm and smc PENTAX DA L 50-200mm lenses will ship in early 2009. * The smc PENTAX DA Star 60-250mm f/4 ED[IF] SDM lens will ship in January 2008 at US $1499.95. * The smc PENTAX DA Star 55mm f/1.4 SDM lens will ship in January 2008 at US $799.95. * The PENTAX AF160FC Ring Flash will ship in November 2008 at US $499.95. * The smc PENTAX DA 15mm f/4 ED AL Limited lens and 1.4X Rear Converter SDM price and availability are to be announced. (b) Price and shipping date subject to change.